A lorry driver who always believed he would win finally did so after 21 years of playing. He won £1 million and a South African luxury vacation trip. As soon as Simon Beach learned he had won, he quit his job. Now he is looking forward to hitting the golf greens more. 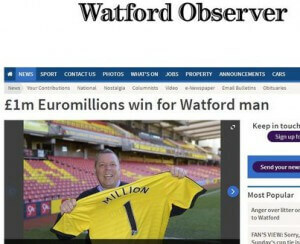 A lorry driver from Watford who won on the lottery quit his job the same day. As he is the primary carer for elderly parents, he opted cash in lieu of the vacation and took home a grand total of £1,054,720. He says he is happy to know he can now afford the best care for his parents.